I realize that this is a slight departure from my normal blog post topics here (of which there have been precious few lately, I know), but this is a subject I have a strong opinion on and wanted to share it. This will be a series of posts, one every day for as long as it takes to share everything. Let's start with a brief introduction, to be followed tomorrow by Part 1. 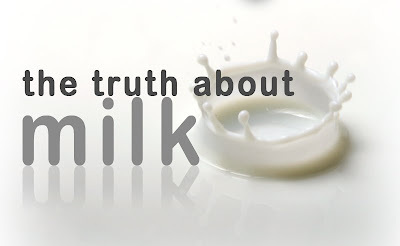 For several generations, the dairy industry has done a tremendous job convincing us that milk, specifically cow's milk, is a miracle drink, providing an incredible amount of nutrients to the human body. The vast majority of people strongly believe that milk is a requirement for health. The current tag-line of the dairy industry is even, "Milk: Nature's Wellness Drink." Unfortunately, nothing could be further from the truth. Over the next several days, I will explore and explain why milk is far from healthy and is actually considerably detrimental to your body's well-being. All of the claims I make and statistics I refer to will be linked to their source material and I will strive to present facts, not my opinion. If nothing else, I hope that by reading this series of posts, you will begin to ask questions. That's all I ask, is for people to not simply accept things, but to ask questions. There are so many things in life that the general public just accepts because, "that's the way it's done." If your doctor told you you needed to have your leg cut off, you would probably seek a second opinion. But when your doctor tells you to get a tetanus shot or to drink lots of milk, would you think to question that? I hope so. And even if you come to a different conclusion than I do, as long as you're doing some research and asking questions for yourself, then I've done what I set out to do. Look for Part 1 of the milk series tomorrow where I'll discuss the history of the dairy industry and it's consistently effective advertising campaign.